Have questions about harassment in the workplace? We have answers. Harassment in the workplace is a complicated issue. One that may leave you with many unanswered questions. We've collected some of the pressing questions asked of us and solicited answers from two great lawyers, Compli's own Kynzie Sims, and our friend Steve Roppolo of the law firm Fisher Phillips. If you still have more questions after reading this Q&A, reach out to us anytime. Download the Anti-Harassment Q&A Now. Have an anti-harassment policy, process, or training question? 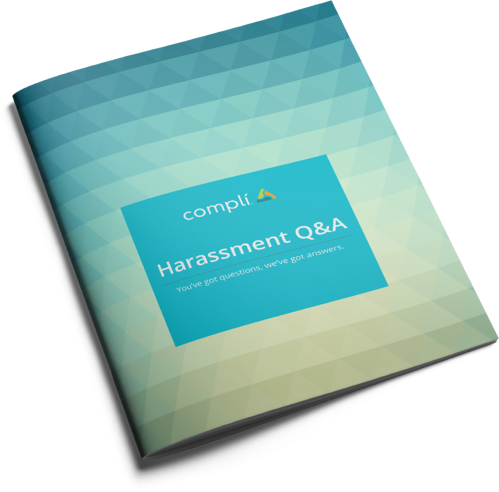 From "zero-tolerance" policies to what is and what is not illegal harassment, we answer a myriad of questions relating to workplace harassment.